I love getting mail, too. Nothing beats a personalized letter with a stamp on top. Mail delivery gives us the chance to send notes to each other in lieu of a personal visit. 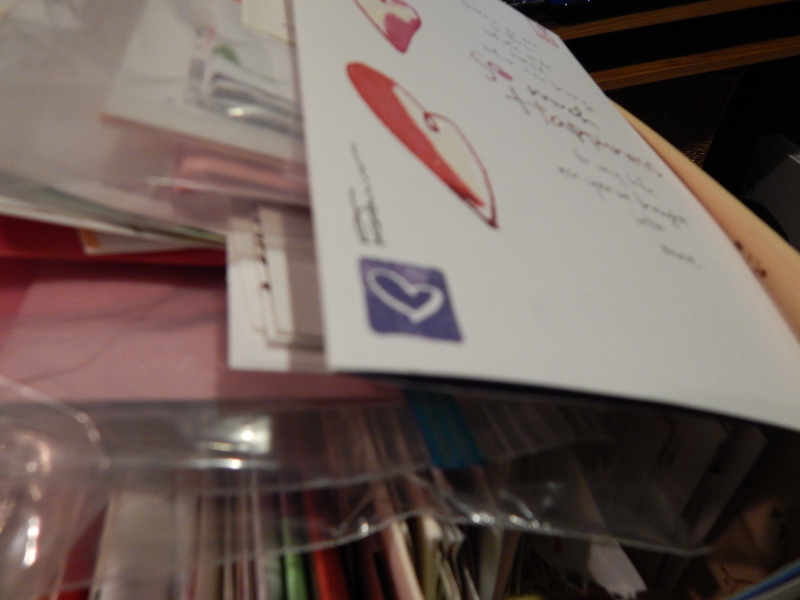 I have an overflowing box full of greeting cards and handwritten notes, all of which I treasure. I tried to select one particular card for this blog but couldn’t. When I started to read them, my trip down memory lane caused my eyes to flood with tears and my heart to overflow like the box in front of me. The cards and notes all shared messages of love, hope and connections, in abundance. Do you have a box full of greeting cards, too? My season of being a card department merchandiser has ended, and this is my final post into this Cards and Conversations blog. However, the significance of connecting people with each other through greeting cards will always continue. Back to those grandchildren. I loved the grandmother’s commitment to send notes to her grandchildren instead of quick messages through texting. She’s continuing a tradition of taking the time to write a sentiment and send it in the mail. These are the cards and notes we will keep and look at many years later. These are the kinds of notes which bring a smile as they trigger our memories and kindle our relationships. Yes, the mail system also delivers what I don’t enjoy: the bills, the junk mail, and the ads. One of those ads I received recently was sent in an envelope printed with my name in a computerized form of cursive, and I noticed it. Maybe it’s personal? When I realized it was perfectly printed, I dismissed it along with the others, and looked for something personal instead. When my address is printed in imperfect cursive, then I know it’s a perfect note. Think of me when you buy a card for someone. Cards will always enhance connections in my life. I hope they enhance connections in your life, too.